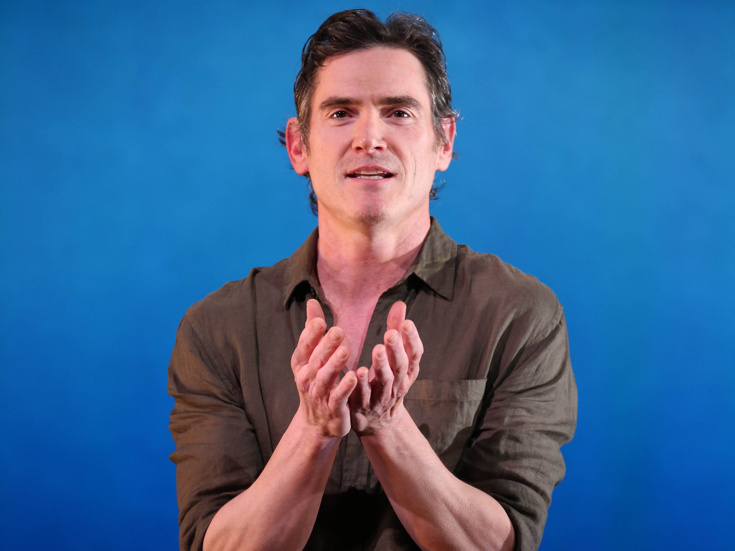 Billy Crudup in "Harry Clarke"
David Cale's acclaimed new solo play Harry Clarke, featuring Tony winner Billy Crudup playing 19 roles, will transfer from its recent debut home at the Vineyard Theatre to fellow off-Broadway venue the Minetta Lane Theatre. Performances will start back up on March 7 with an official opening set for March 18. Tony nominee Leigh Silverman directs the work, which first ran in the fall of 2017. Harry Clarke follows a shy Midwestern man (Crudup) who leads an outrageous double life as the cocky Londoner Harry Clarke. Moving to New York City and presenting himself as an Englishman, he charms his way into a wealthy family’s life as the seductive and precocious Harry, whose increasingly risky and dangerous behavior threatens to undo more than his persona. The creative team of Harry Clarke includes scenic design by Tony nominee Alexander Dodge, costume design by Kaye Voyce, lighting design by Alan C. Edwards, sound design by Bart Fasbender and original music by Cale. Harry Clarke will play a 10-week limited engagement through May 13. Hear more about Harry Clarke in the Broadway.com Show segment below. Billy Crudup stars in this new solo play about a shy midwestern man living an outrageous double life.